This doesn’t have the most appealing name. Apparently this was pretty much a made up concoction with a weird, made up name, to intrigue people into drinking it. Art of Drink has the whole story. Lommebogen has the basic mixers matching up with Savoy and Café Royal, but the base spirit is quite different. 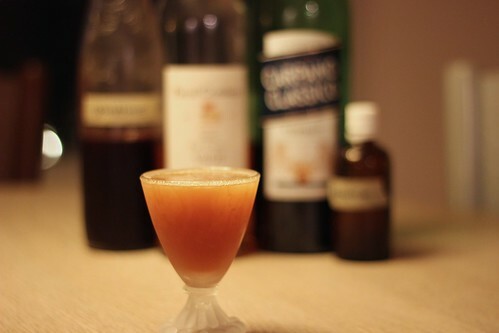 It uses cognac and vermouth instead of gin. Either way this is just a weird drink. Ugh. I had to dump the Lommebogen version. That was foul. The Savoy/Café Royal was “drinkable” but still didn’t feel very balanced. It has a bad name, and it’s a bad cocktail. No need to tarry here.